Thinking of leasing a new car? Did you know that there are 26 different car categories according to TrueCar.com? Did you know that you can lease any of the new cars at any new car lot? Yes even commercial vehicles. Did you know that the price of leasing a new car is based solely on the Residual Value of the car? 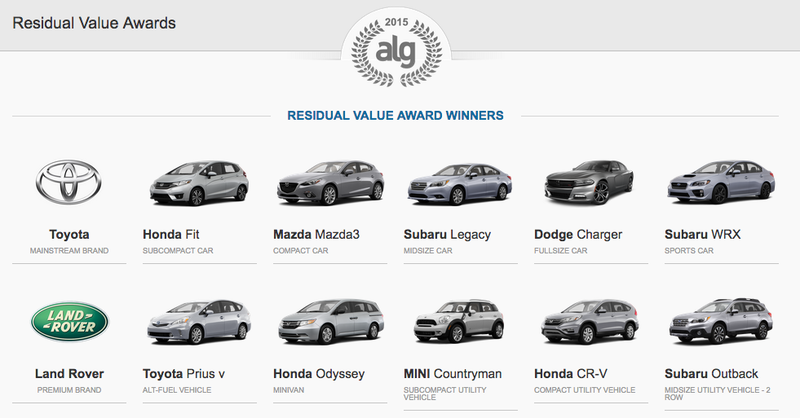 Do you know what Residual Value means? Residual Value is all about how much the car will loose value over the term of the lease. "It describes the future value of a good in terms of absolute value in monetary terms and it is sometimes abbreviated into a percentage of the initial price when the item was new. Example: A Honda is sold at a list price of $20,000 today. After a usage of 36 months and 50,000 miles its value is contractually defined as $10,000 or 50%. The credited amount, on which the interest is applied, thus is $20,000 present value minus $10,000 future value." Another way to see it is how much will the car be worth at the end of the lease based on age and mileage. Now you can purchase the vehicle after the term of the lease from the dealer and skip out on paying interest over the term of the lease which is great! You just cannot renegotiate the price after the first contract is signed. Here are the 26 best cars that hold the most value off the lot which in fact makes them the cheapest cars to lease for that style of car.